Preheat the oven to 375F. Line an 8 inch square metal pan with nonstick foil. Mix together the flour, cinnamon, chipotle powder and nutmeg. Set aside. Melt the butter in a small saucepan or in a microwave-safe bowl. Add the salt, chocolate and coffee Reduce heat to low, and stir until melted. Remove from heat and allow it to cool slightly. In a mixing bowl, beat eggs on high speed of an electric mixer. Gradually add sugar and vanilla, beating 3 minutes or until thick and pale. Add chocolate mixture, beating until blended. Gradually add flour, beating at low speed just until blended. Stir in chocolate morsels. Pour into the pan and sprinkle pecans over the top. Bake on center rack at at 375° for 30 minutes. 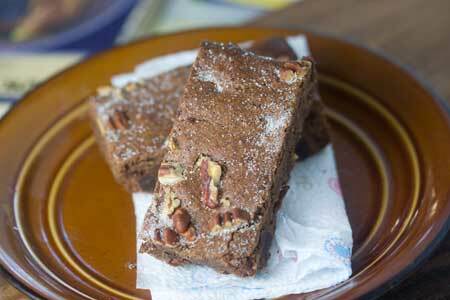 Remove from the oven and sprinkle hot brownies with cinnamon sugar. Set the brownie pan in a in a roasting pan filled half way with ice water (it should come about 2/3 of the way up the sides of the brownie pan, let sit for 15 minutes to quick-cool, then transfer to refrigerator and chill for another hour or two or until very cold. Lift foil with brownies out of pan. Cut brownies into squares. Ice bath cooling is optional, but it sure worked well here! Consider using half ancho and half cayenne in place of the chipotle. To make cinnamon sugar, use 2 teaspoons of granulated sugar and a big pinch of cinnamon. If you want, add some grated chocolate to the cinnamon sugar. I used cinnamon sugar leftover from the Mexican cookies posted yesterday.